Take action, walk the walk, pay it forward – no matter what you call it, we want you! In 1991, Gift of Life Marrow Registry started as a grassroots effort and that spirited community approach is still at the core of the organization’s operations. Volunteers are an essential part of the Gift of Life family and we offer many opportunities – you can easily find a place for your talents. Whether you have a personal tie to the cause, want the opportunity to help others, or want to meet forward looking people with a positive attitude, we welcome you to join us! When you volunteer with Gift of Life, you will find it personally rewarding to know that your actions helped save someone’s life. What is it like to be involved with Gift of Life? These three volunteers explain what attracted them to the organization, and why they keep coming back. 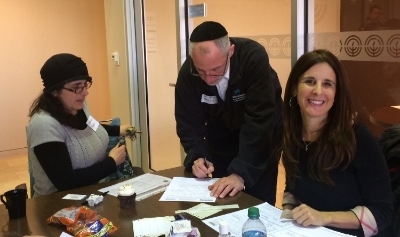 Susan Weiss [r] holds a donor drive on Super Sunday at the Jewish Federation of Cleveland, Ohio. 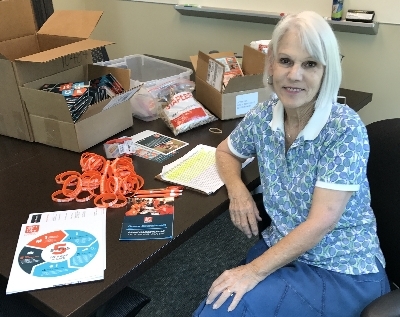 Susan Weiss, a former accountant who works in a school office in Cleveland, Ohio learned about Gift of Life in 2005 when her sister became involved in holding recruitment drives to help find a donor for a teenage girl suffering from leukemia. Susan volunteered to run drives as well, and twelve years later, she’s still at it! “My first drive was held before social media began,” said Susan. “I emailed everyone I could think of, the Jewish Federation, day schools, law offices, businesses and synagogues. I posted signs everywhere – and to my surprise, 500 people came to the drive!” Susan has had tremendous success, as is shown in her Donor Circle. Gift of Life makes it easy for Susan – or any volunteer – to run a drive. After a training session by phone, your drive supplies, which include swab kits and brochures, are shipped to your door. On completion of the event, items are shipped back to our office using a prepaid shipping label. Dale organizing supplies for a donor recruitment drive. Dale MacCutcheon, a retired teacher of 38 years and resident of Boca Raton, Florida, started volunteering at the Gift of Life headquarters in 2016 when a friend invited her. "There are plenty of places to volunteer, but I keep coming back because I like the people,” said Dale. Gift of Life holds donor recruitment drives and fundraising events across the United States, and leftover supplies are shipped back to the office after each event. That’s when Dale takes over. Dale’s eye for detail ensures that Gift of Life’s events always run smoothly. Mike volunteers at Gift of Life events in New York City, including Celebrating Life and the Steps for Life 5K Run & Walk. Many who donate blood stem cells or bone marrow develop a deep connection to Gift of Life and have a strong desire to further the mission. One such volunteer is Mike Sprachman who donated stem cells in April 2013. Mike was accompanied to his donation by Gift of Life Project Manager Nick Hudson, who invited him to join the Young Professionals Committee in New York. Mike jumped right into the networking group to help plan and organize events, including the annual Celebrating Life NY fundraiser honoring donors and recipients, as well as the Steps for Life 5K in New York. “What I like best about volunteering is meeting new people and giving back to Gift of Life,” said Mike. “When I tell the organization’s story it’s also my own story as a donor, and this is a mission I believe in. 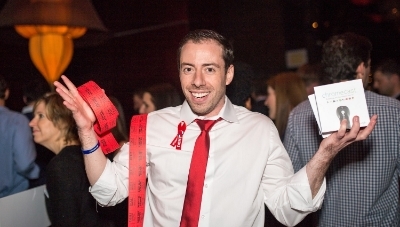 I’m able to answer questions from personal experience, and that helps people decide to become involved.” Mike, who works at a software company in Manhattan, is great at tracking down exciting raffle items that will attract big contributions at fundraising events. “It’s a lot of work chasing people down to get these arranged, but I make connections with new people and can educate them about Gift of Life’s mission,” he said. What can volunteers do at Gift of Life? Donor Recruitment Drives: Organize, publicize and run donor recruitment drives in your community. Steps for Life 5K Run & Walk: Gift of Life 5Ks are held in Boca Raton, Florida, Boston, Massachusetts and New York City. Large numbers of volunteers are needed for the planning committees and at the events. Committee members recruit corporate sponsors and publicize the events locally. Day-of-event volunteers help with registration, packet pickup, food and water tents, donor recruitment table, chance drawings and much more. Public Speaking and Education: Marrow and stem cell donors save lives, and sharing that message is a key mission at Gift of Life. If you have a talent for public speaking, or are a donor or recipient and want to share your personal story, there are many opportunities to help us spread the word. Volunteering at Gift of Life Headquarters: Your help at our headquarters in Boca Raton, Florida, is invaluable and many opportunities are available. Call 561-982-2900. Young Professionals Committees in New York and Los Angeles: Are you between the ages of 22-45? Consider joining the Young Professional Committees who meet for networking activities and give back by supporting Gift of Life’s mission through various events and fundraisers. Call 800-962-7769 today to volunteer with Gift of Life Marrow Registry – you’ll find great people, rewarding opportunities, and a team that appreciates you!